Every organisation stands and falls on getting their numbers right. Accountants know that even Oscar Schindler would had found it impossible to save hundreds of lives without Itzhak Stern. Equally, they understand why the Cali Cartel needed Guillermo Pallomari. Whether you want to score a unique “job” like these, or simply move up the corporate ladder, our accountant resume samples will help you write a resume that will catch any employer’s eye. As an accountant, you want to stand out while communicating dependability and attention to detail first and foremost. For this reason, flashy resume templates are a big no-go in the world of accounting resumes. 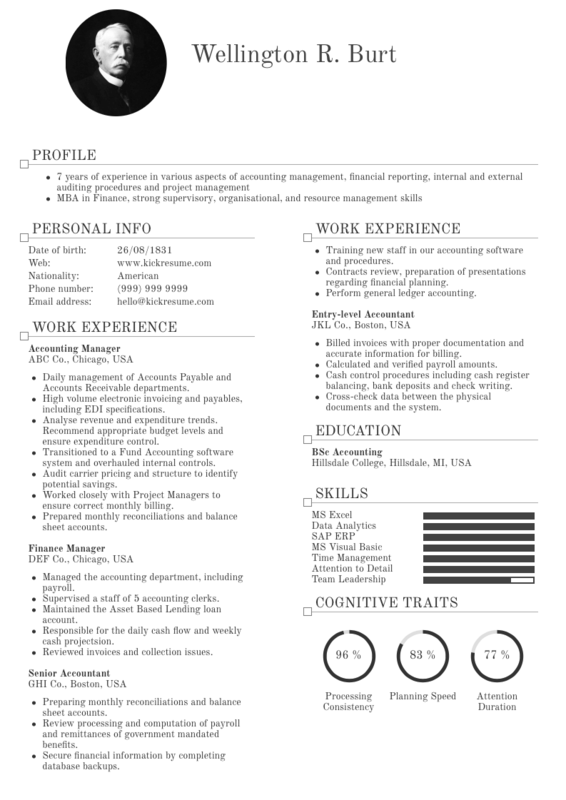 Each of the accountant resume samples below sports a minimalistic template that implies these qualities. Second, the language you use in your resume is equally important. It needs to be exact, straight to the point, and contain all the important keywords. 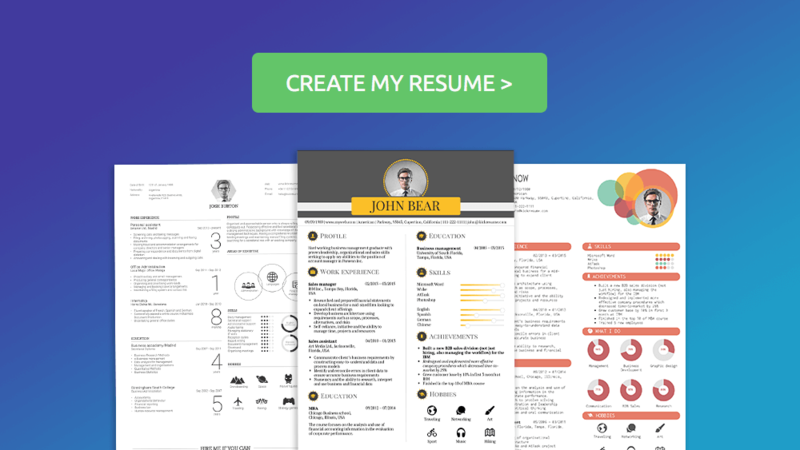 These resume samples contain key phrases we’ve extracted from over 400k resumes created using Kickresume. 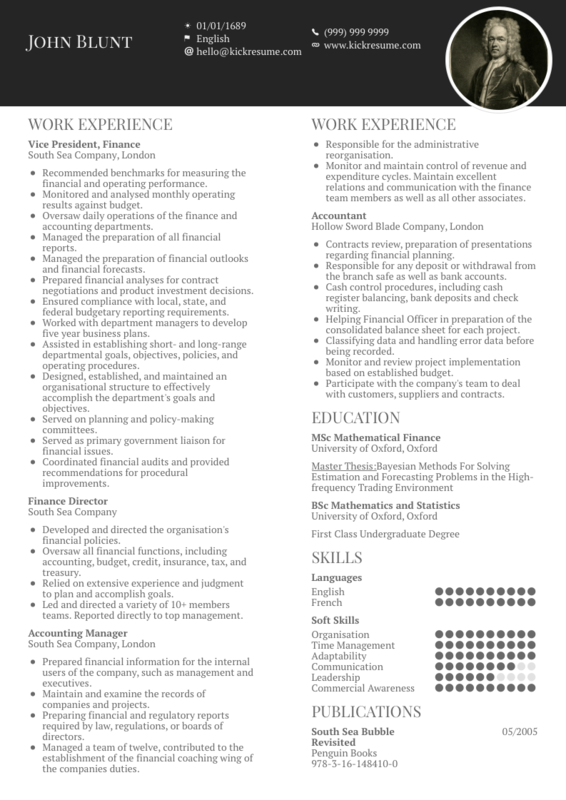 Third, in designing these resume samples we’ve paid most attention to their structure and formatting. Each of the individual sections is divided into bullet points, which facilitates easy reading. After all, your resume only has 6 seconds to leave a lasting impression. A well-structured resume ensures your professional qualities get the attention they deserve. Finally, if at the end of this post you feel like you still need more advice, check out our ultimate resume guide. Or even better, you can download our ebook. But enough words! Learn what you can from these 10 accountant resume samples and good luck! 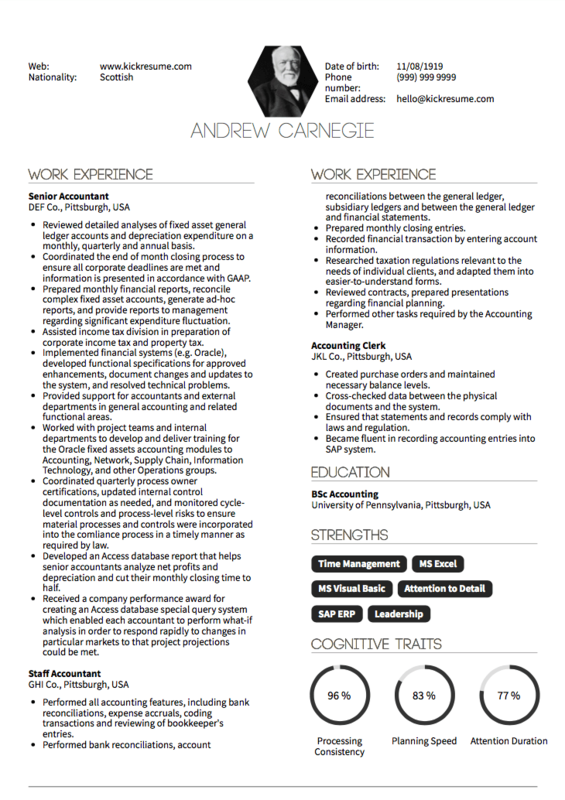 This resume sample exemplifies what an accounting student resume should look like. At this point in your career, you probably don’t have much experience to show. For this reason, the education and skills sections dominate this resume. Each of the two is quite extensive and describes in detail what skills did the candidate acquire and how. Finally, when you cannot depend on previous experience, related extracurricular activities can help support your candidacy too. When you’re applying for an accounting position, you need a very strong resume. Once you’ve acquired two or more years of professional experience, the only remaining challenge is to articulate it well on a resume. Notice how this resume opens with a professional summary. In doing this, it it allows hiring managers to immediately find what they want to see. 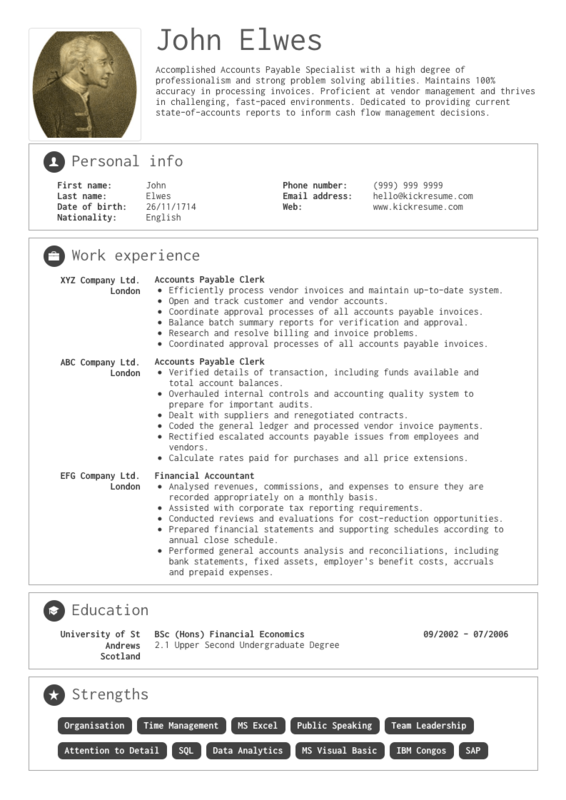 In this resume sample, we’ve put the education section right after the profile. Although it’s not a mistake, you might want to consider putting it below your work history section. After all, two years into your career education becomes less relevant. 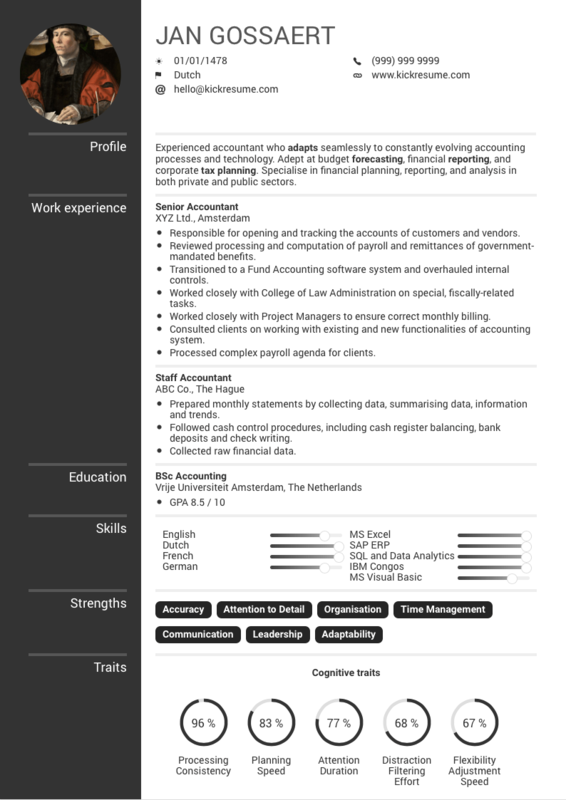 This graduate accountant resume sample focuses is razor-sharp in its focus. Naturally, education comes first—straight out of college, your degree is still your strongest asset. Since this particular candidate did multiple internships during his studies, the rest of the resume simply lists the experience he acquired during that time. And does it in an easy-to-read and structured manner. As a seasoned professional, you could easily write a resume more packed with relevant information than this one. In spite of that, we wanted to show that sometimes it’s equally useful to let your resume breathe a little. This resume doesn’t overwhelm hiring managers with a wall of text but makes a great use of white space and straight-to-the-point bullet points. Something to keep in mind while writing your own resume. You don’t always need to include every piece of information to make a lasting impression. 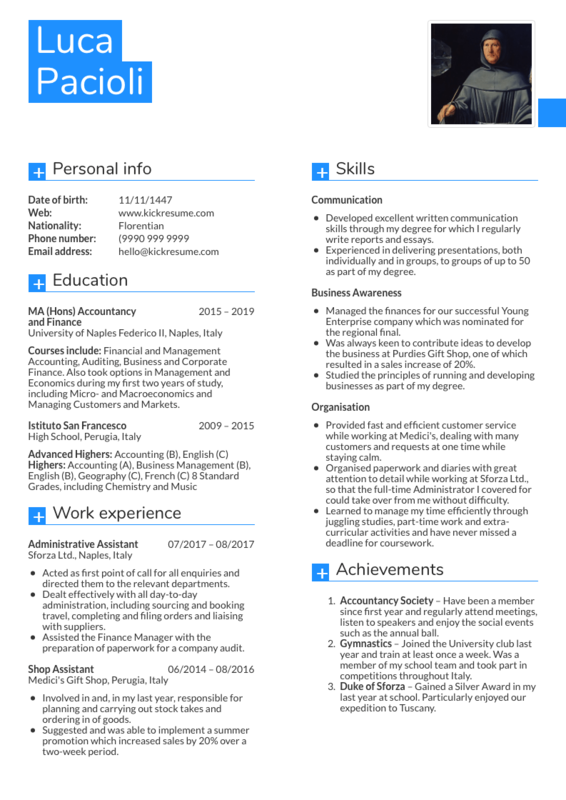 This accountant resume sample packs a lot of information on a single page. If you’ve ever felt like you can’t possibly make your resume shorter, this sample proves you wrong. Note the use of past tense in the first two bullet point sections as compared to the last section’s simple list of responsibilities. The lesson is clear—what you did is always more impressive than what you were supposed to do. 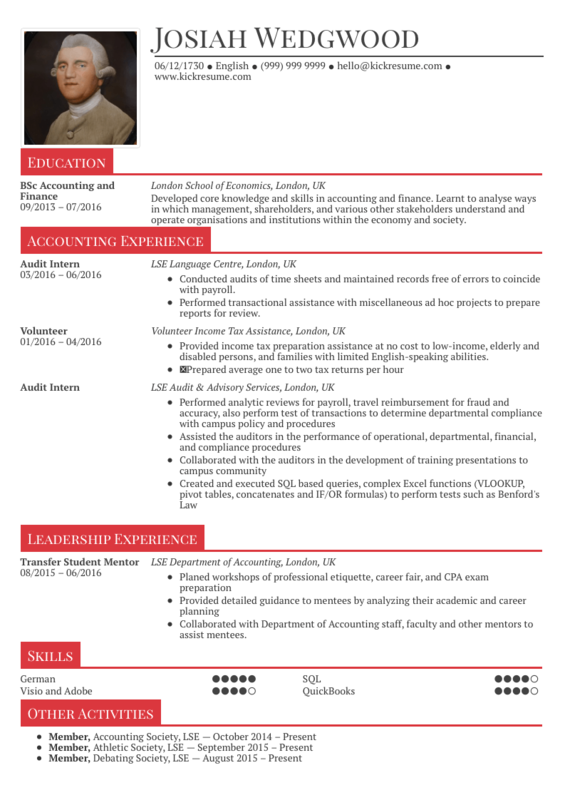 This accountant resume example is designed to do a lot with little. In spite of the candidate’s limited experience, the resume succeeds in making it look more robust than it actually is. 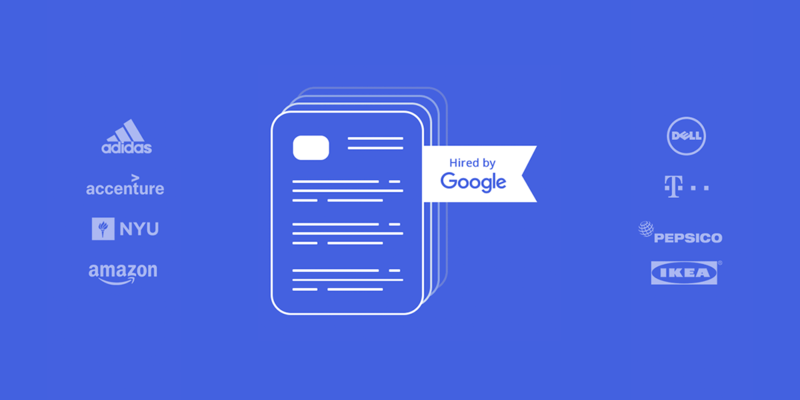 One of the reasons behind this is a smart choice of a resume template—it makes the space reserved for text more conflated. Other reason is its use of strong visual elements, such as charts and sliders. It’s a great example of how the content of your resume has to go in hand with its form. 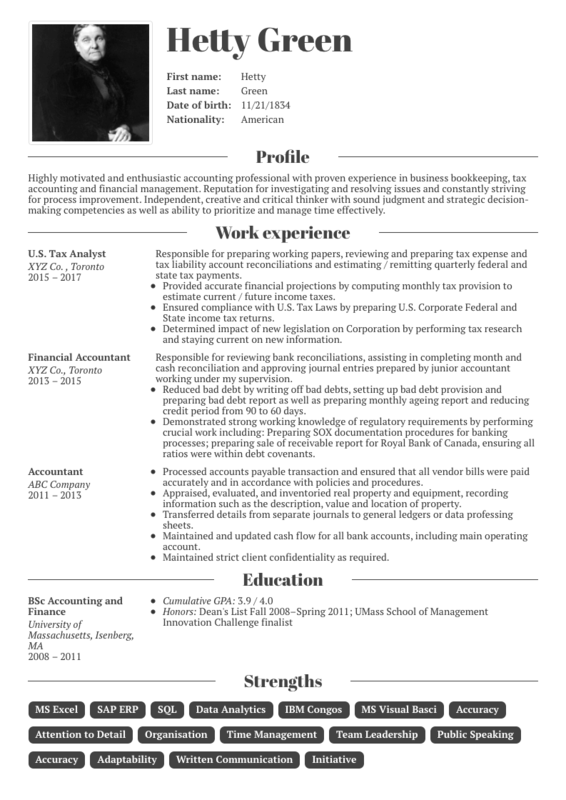 When applying for a job as a CPA tax analyst, you need a very strong resume. The resume below has the air of steadfast responsibility about it. The template design is very formal and doesn’t seek to impress in anything but its minimalism. Similarly, you’d be hard-pressed to find anything irrelevant on this resume. Instead, this accountant resume sample packs an impressive number of keywords to ensure that it gets through any ATS. 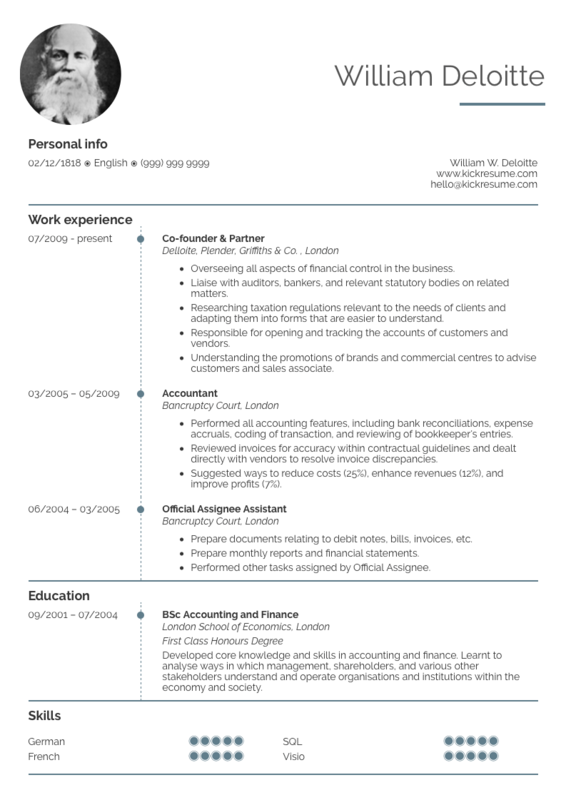 A pretty standard mid-level accountant resume example. The opening career summary outlines the candidate’s strongest qualities while remaining concise. If you want to improve on it, structure yours using bullet points to make it easier to read. Second, notice the use of past tense in each of the subsections. Such use of language has much greater impact on the reader than a simple list of responsibilities. Finally, even if keywords are missing in the main body of the resume, the strengths section makes up for it. In many ways, the resume below is a great example of how not to do it. Although it belongs to a candidate who held multiple managerial positions, it hardly ever presents any quantifiable accomplishments. Numbers are impactful and you should never pass on an opportunity to present your experiences by using them. Otherwise, this resume sample is clear and well-structured. The use of a two-column template design allows it to pack a lot of information on a single page. 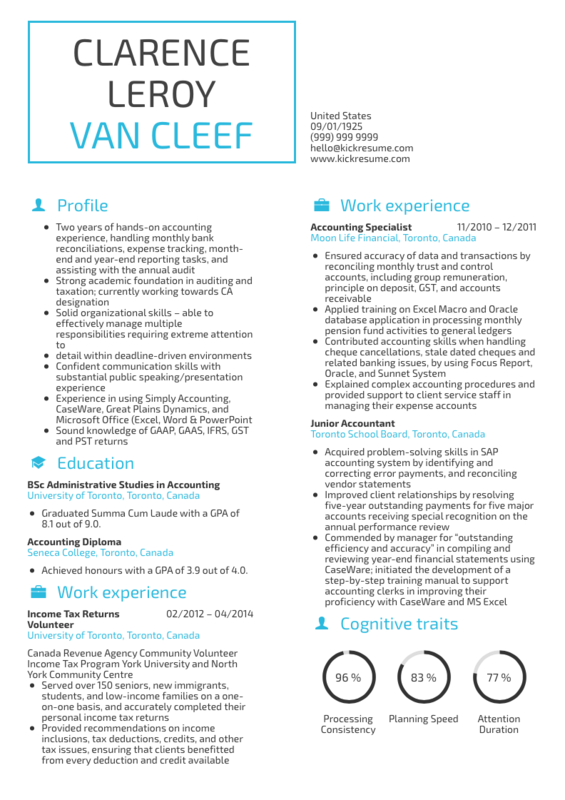 Accountant resume samples like the one below impress through the candidate’s sheer wealth of experience and skills. Remember, it’s all about those first 6 seconds. 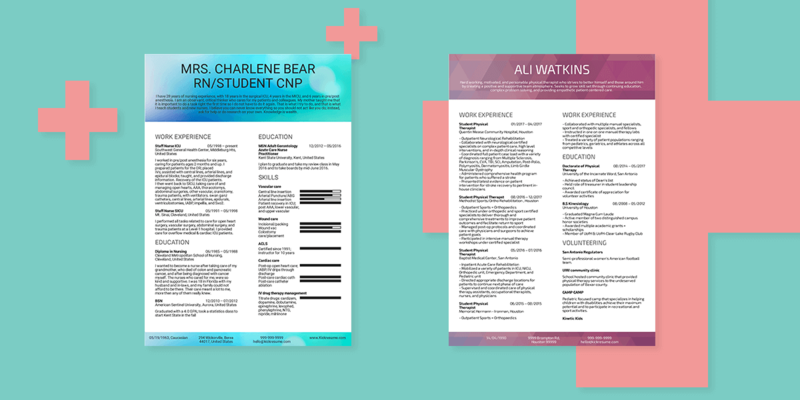 This resume example catches the recruiters’ attention by making it visually apparent that this candidate’s experience is extensive. The takeaway is clear—once you’ve become a seasoned professional, even a wall of text on your resume doesn’t necessarily have to be a bad thing.